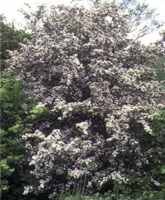 Shrub or small tree with small white blooms followed by red edible berries carried in clusters. Fruits are used as those of C. douglasii (above) and a tea is sometimes made from the twigs. The plant prefers moist well drained soils in full sun or partial shade, is very tough and can take air pollutants and heavy trimming. It is very tolerant and can stand some drought. The blooms, like those of all hawthornes, have a distasteful smell. This species is nearly thornless. Hardy to -20F (-28.8C); height: 30ft. 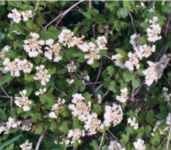 This hawthorne species has white blooms and berries that are edible, but are used primarily as food for wildlife. They can be used to make jellies and jams, and are sometimes dried and used in baking, or as a coffee substitute. 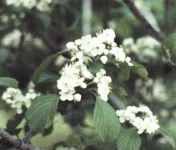 Medcinally, like other hawthorne species, it is used to treat heart problems, malaria and to enhance memory. Hardy to -20F (-28.8C); height: 15ft. White spring blooms, edible red berries. Can be used like other hawthorne species. Open, rather shaggy growth habit. Hardy to -20F (-28.8C); height: 15ft.